How a toxic debate over the first Americans hobbled science for decades. 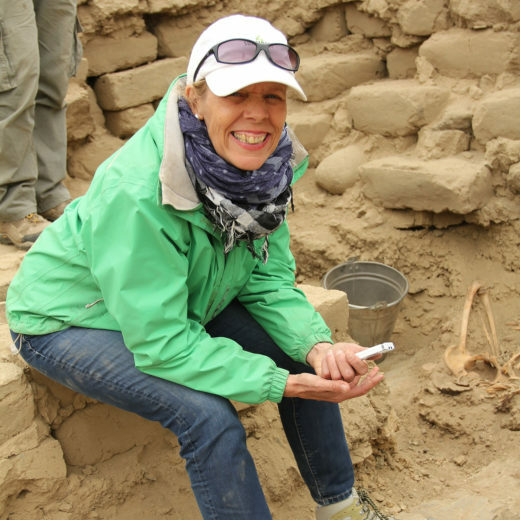 Congratulations to Heather Pringle on winning a Canadian Archaeological Association (CAA) Public Communications Award for this article. What I remember most about Jacques Cinq-Mars the first time we met was his manner—one part defiance, one part wariness. It was 1994, and I had just flown into the small village of Old Crow in northern Yukon; Cinq-Mars was waiting in the tiny airport. Tall, grizzled, and unshaven, the French-Canadian archaeologist looked every bit the old Yukon hand. Still fit in his early 50s, he worked as a curator at what is now called the Canadian Museum of History in Gatineau, Quebec. But Cinq-Mars lived for summer fieldwork, combing Yukon riverbanks and rock shelters for traces of Ice Age hunters. In three hollows known as the Bluefish Caves, he and his team had discovered something remarkable—the bones of extinct horses and wooly mammoths bearing what seemed to be marks from human butchering and toolmaking. Radiocarbon test results dated the oldest finds to around 24,000 years before the present. Bluefish Caves directly challenged mainstream scientific thinking. Evidence had long suggested that humans first reached the Americas around 13,000 years ago, when Asian hunters crossed a now submerged landmass known as Beringia, which joined Siberia to Alaska and Yukon during the last ice age. From there, the migrants seemed to have hurried southward along the edges of melting ice sheets to warmer lands in what is now the United States, where they and their descendants thrived. Researchers called these southern hunters the Clovis people, after a distinctive type of spear point they carried. And the story of their arrival in the New World became known as the Clovis first model. Cinq-Mars, however, didn’t buy that story—not a bit. His work at Bluefish Caves suggested that Asian hunters roamed northern Yukon at least 11,000 years before the arrival of the Clovis people. And other research projects lent some support to the idea. At a small scattering of sites, from Meadowcroft in Pennsylvania to Monte Verde in Chile, archaeologists had unearthed hearths, stone tools, and butchered animal remains that pointed to an earlier migration to the Americas. But rather than launching a major new search for more early evidence, the finds stirred fierce opposition and a bitter debate, “one of the most acrimonious—and unfruitful—in all of science,” noted the journal Nature. Cinq-Mars, however, was not intimidated. He fearlessly waded into the fight. Between 1979 and 2001, he published a series of studies on Bluefish Caves. It was a brutal experience, something that Cinq-Mars once likened to the Spanish Inquisition. At conferences, audiences paid little heed to his presentations, giving short shrift to the evidence. Other researchers listened politely, then questioned his competence. The result was always the same. “When Jacques proposed [that Bluefish Caves was] 24,000, it was not accepted,” says William Josie, director of natural resources at the Vuntut Gwitchin First Nation in Old Crow. In his office at the Canadian Museum of History, Cinq-Mars fumed at the wall of closed minds. Funding for his Bluefish work grew scarce: his fieldwork eventually sputtered and died. Today, decades later, the Clovis first model has collapsed. Based on dozens of new studies, we now know that pre-Clovis people slaughtered mastodons in Washington State, dined on desert parsley in Oregon, made all-purpose stone tools that were the Ice Age version of X-acto blades in Texas, and slept in sprawling, hide-covered homes in Chile—all between 13,800 and 15,500 years ago, possibly earlier. And in January, a Université de Montréal PhD candidate, Lauriane Bourgeon, and her colleagues published a new study on Bluefish Caves bones in the journal PLOS One, confirming that humans had butchered horses and other animals there 24,000 years ago. “It was a huge surprise,” says Bourgeon. The new findings, says Quentin Mackie, an archaeologist at the University of Victoria in British Columbia who was not a member of the team, are prompting the first serious discussion of Bluefish Caves—nearly 40 years after its excavation. “This report will tilt the scales for some [archaeologists] towards accepting the site, and for some more, it will inspire a desire to really evaluate the caves more seriously and either generate new data or try to replicate this study,” Mackie notes. I first came across the research at Bluefish Caves in the early 1990s. As a science journalist, I was working on a book on North American archaeology, and I was curious about what Cinq-Mars and his team had found. I called him up and near the end of the conversation, I inquired about the possibility of traveling to Bluefish Caves, which lay north of the Arctic Circle. A few weeks later, Cinq-Mars invited me along on some helicopter surveying planned for the summer and offered to show me the caves. I booked a ticket to Old Crow. Cinq-Mars was working out of a small field station in the village, a cabin that backed onto the Porcupine River, whose waters meandered their way to the Bering Sea. He had teamed up that summer with Bernard Lauriol, a geographer at the University of Ottawa, on an environmental study of Beringia. I pitched my tent out behind the cabin and swatted in vain at the dense cloud of Yukon mosquitoes. That night, I lay awake for hours. In the distance, I could hear children laughing and giggling on rooftops in the village, making the most of the midnight sun. The next morning, Cinq-Mars made coffee and bannock for us, and we headed off to the airport, a pattern we followed for the better part of a week. And each day, as the helicopter lifted off and swung west or north, we left the modern world behind us: in the green below, there were no roads, no pipelines, no mines, no clearcuts. Below us lay unbroken forest, jagged peaks, and silvery threads of creeks and rivers, shimmering in the morning light. It was beautiful beyond description, and even now, more than two decades later, I dream at night about those flights, soaring effortlessly over paradise. Some days we stopped in lowland areas, trudging through tussocky tundra or muskeg to get to a sampling site. On others, Cinq-Mars led the way into caves he wanted to check out. As the helicopter pilot waited, we ducked into shadowy entrances and wriggled through narrow passages, looking for traces of red ochre on the walls, or flecks of charcoal on the cave floor. There was no sign of either, but Cinq-Mars wasn’t deterred. He carried a big map in his pack and continually tugged it out to add more notes to the margin. Finally, the day for Bluefish Caves arrived. Cinq-Mars needed additional measurements of the caves, and had asked an assistant, Stringer Charlie, to help. As the helicopter swept southwest from Old Crow, the three of us gazed out in silence at the forest until Cinq-Mars and the pilot spotted a small limestone ridge rising from the spruce, and dark, shadowy gashes in the rock—Bluefish Caves. Landing nearby, Cinq-Mars, Charlie, and I clambered out with our gear and began hiking up a narrow trail to the first of three small caves. The ridge looked out on a stunning expanse of lowland and the winding banks of Bluefish River, named after the Arctic grayling that flourished there. Cinq-Mars had first spotted the shallow caves from the air, while helicopter surveying in 1975. Landing briefly, he had taken a quick look inside the shallow caverns. Over the next three years, he and a small archaeological team returned twice, once for 10 days to open a test excavation. The preservation inside the caves was remarkable: the dry, cold environment conserved even fragments of ancient beetles and weevils. And in the sediments, the team found the bones of extinct horses and other large ungulates, as well as ancient stone tools, including microblades—a narrow cutting tool used by Ice Age hunters in Asia. Encouraged, Cinq-Mars expanded the excavation. And back in Quebec, at the Canadian Museum of History, he worked closely with botanists, entomologists, zoologists, and other researchers to analyze the environmental data. It was a heady time. The dig yielded more stone tools, as well as other evidence of human activity—a horse jaw with incisions resembling cut marks, and a mammoth long bone that seemed carefully worked and flaked, as well as a cutting tool made from the bone. Samples from these finds yielded radiocarbon dates as old as 24,800 years ago. As we stood and chatted near the rugged entrance of Cave II in 1994, Cinq-Mars shared his thoughts on what had taken place at the site. During the depths of the last ice age, large carnivores had prowled the ridge, gnawing carcasses in the caves. But from time to time, Ice Age humans had taken shelter there, too. “You can think of a small hunting party stopping in one of these caves for an afternoon, if it was a rainy day or a bad blizzard or a freak storm,” he said. And he steadfastly refused to budge from the early dates he had published. “I’m now in a position to state that Bluefish Caves represent the oldest-known archaeological site in North America,” he told me. But relatively few of Cinq-Mars’s peers shared his confidence. And as I began regularly attending archaeological conferences in the years following that trip to Bluefish Caves, I saw what Cinq-Mars was up against. Sitting in halls with Canadian and American researchers, I witnessed what happened when archaeologists presented data that contradicted the Clovis first model. Often a polite bemusement spread through the room, as if the audience was dealing with some crackpot uncle, or the atmosphere grew testy and tense as someone began grilling the presenter. But once or twice, the mask of professional respect slipped completely; I heard laughter and snickering in the room. Tom Dillehay remembers such conferences well. “Some Clovis first people had a suffocating air of defiance and superiority at times,” he says. In general, the critics focused their attacks on two major fronts. They questioned whether key artifacts at proposed pre-Clovis sites were really made by humans, as opposed to natural processes. And they pored over presentations and reports for any possible errors in dating. At Bluefish Caves, the crucial evidence consisted of animal bones that were dated to around 24,000 years ago and seemed to be cut, shaped, or flaked by humans. So critics focused on those. They dismissed Cinq-Mars’s identification of butchery marks and tools, and offered alternative explanations. Rockfall from the caves, they suggested, had fractured the bones, leaving splinters that merely looked like human artifacts. Or large carnivores had chomped on a carcass, producing grooves that resembled cut marks or fragments mirroring artifacts. Some skeptics even suggested that living mammoths could have taken bad tumbles nearby, accidentally splintering limb bones. Other critics wanted to see multiple lines of evidence for the presence of early humans at Bluefish Caves, including dated hearths with stone tools in close association. Stung as he was by the criticism, Cinq-Mars refused to back down. None of the explanations for splintered bones, he noted, could account for the complex chain of steps that produced the mammoth-bone flake tool his team found. But by then, serious doubts about the Bluefish Caves evidence had been sown, taking firm root in the archaeological community: hardly anyone was listening. Cinq-Mars couldn’t believe it. At one presentation he gave, “they laughed at me,” he says angrily today. “They found me cute.” Embittered by the response, he stopped attending conferences, and gave up defending the site publicly. What was the point? To Cinq-Mars, the Clovis first supporters seemed almost brainwashed. In January 1997, a dozen North American archaeologists accepted an invitation from Dillehay to fly to southern Chile to inspect the controversial site of Monte Verde. Dillehay and a large interdisciplinary scientific team had studied the site intensively for two decades after its discovery by loggers. Beneath layers of marshy peat some 50 kilometers east of the Pacific Ocean, the team had discovered stone tools, remains of a large hide-covered shelter that may have housed 30 people, communal hearths, chunks of mastodon meat, and three human footprints. Dillehay and his colleagues had meticulously dated the oldest human activity at the site to 14,500 years ago. But for years, most North American researchers refused to accept the date. So Dillehay took the bull by the horns, inviting several skeptics and other prominent archaeologists to Monte Verde. The visitors personally inspected the site, examining the stratigraphy, and they pored over the evidence for days. At the end, all 12 researchers accepted the evidence from Monte Verde, publicly agreeing that humans had reached southern Chile 1,500 years before the Clovis people. It was a moment akin to “aviation’s breaking of the sound barrier,” wrote one New York Times reporter. Soon after, Dillehay and his colleagues published a 1,300-page report on the site, laying out all the details. Eventually, the findings and new research on the first Americans from the field of genetics put remaining doubts to rest. The Clovis first model was dead, and thousands of researchers began rethinking the timing of the earliest migration to the New World and the routes the migrants may have taken. By then, however, Bluefish Caves had been largely forgotten. But in 2012, Lauriane Bourgeon, a doctoral candidate in anthropology at the Université de Montréal, decided to take a new look. She began microscopically examining 36,000 bone fragments that Cinq-Mars and his team had excavated. Archaeologists who specialized in the study of old animal bones had developed six criteria for the identification of human cut marks, such as the precise shape of the incision and its trajectory. Bourgeon only accepted a mark as evidence of human butchery if it met all six criteria. The new findings are sparking a lot of talk and serious interest in Bluefish Caves. While some archaeologists remain skeptical, withholding acceptance until they see more traces of early human activity at the site, as well as additional sites in the region dated to this period, others, such as archaeologist Ian Buvit, manager of the Shared Beringian Heritage Program at the National Park Service in Anchorage, Alaska, think Bourgeon has come up with important new evidence. “I am convinced those are human cut marks,” Buvit notes. And the study, he adds, lends support to a relatively new scientific model, the Beringian standstill hypothesis. Based initially on studies of DNA from modern indigenous people, this hypothesis suggests that humans roamed Beringia for thousands of years—even during the depths of the last ice age—before their descendants ventured south to colonize the Americas. “I cautiously accept [the new Bluefish Caves study] as the first evidence of humans in eastern Beringia at the Last Glacial Maximum,” Buvit writes in an email. Cite this Article: Heather Pringle “From Vilified to Vindicated: the Story of Jacques Cinq-Mars,” Hakai Magazine, Mar 7, 2017, accessed April 23rd, 2019, https://www.hakaimagazine.com/features/vilified-vindicated-story-jacques-cinq-mars/. New evidence suggests human presence in a Yukon cave during the last ice age 24,000 years ago. A remote Arctic land may hold a vital missing chapter from human history. The only problem? It disappeared at the end of the last ice age.